Working on a team is not a rare event in the working world. Even if your work is very individualized, rarely is the case that you won’t work on a team in some form or fashion. Knowing how to foster effective teamwork in the workplace has many benefits, and is an effort to which you can easily contribute. Teamwork is always more effective when the members maintain good relationships with one another, which begins with trust and clear communication. When it comes to communication, team meetings provide everyone an opportunity to collaborate and share ideas. Because of this, teammates feel informed and involved on the details of an assignment. In the same respect, it will help your teammates have a sense of belonging. Nurturing these relationships through trust and communication is a great way to foster teamwork. When you have a team that works well together, job satisfaction usually increases. Conversely, when you don’t have good teamwork in the workplace, it could have the opposite effect. A team that supports each other is able to focus on the bigger picture of reaching a goal or accomplishing a project on time, leaving everyone involved more satisfied with their work. While you help foster teamwork in the workplace, you’ll likely see a correlation between a strong team and individual strengths. On a well-managed team, each person is able to bring something different to the table, complementing one another in the process. As you work as part of a team, look for ways to encourage other members and learn from their strengths to grow professionally. 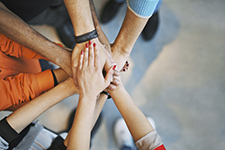 How do you encourage teamwork in the workplace? Why do you think it’s important? Let us know in the comments section below! Previous Post The Results Are In: What Does Your Dream Job Look Like?